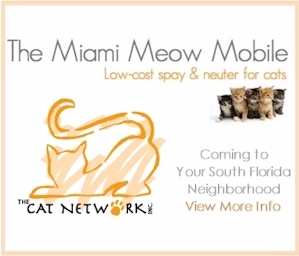 The Miami Meow Mobile low cost spay and neuter van is coming to YOUR SOUTH FLORIDA NEIGHBORHOOD this June. 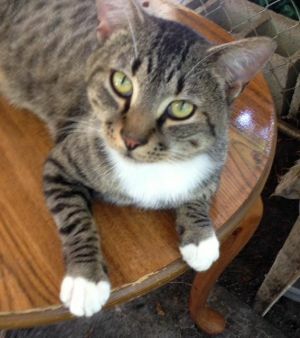 The Miami Meow Mobile provides low cost spay & neuter surgeries, vaccinations, and basic wellness care to cats and kittens in Miami-Dade county. It is a fully equipped surgery center on wheels, ready to provide the safest possible sterilization procedures for our feline friends. The clinic is owned and operated by The Cat Network, Inc., a 501(c)3 Florida not-for-profit corporation dedicated to humanely reducing cat overpopulation by educating the public about the need to sterilize their pets and strays; providing access to low-cost spay & neuter services for cats; helping members in their efforts to place adoptable cats in loving homes; and advocating non-lethal population control and humane public policy. For answers to Frequently Asked Questions pertaining to cat spay & neuter, appointments, trapping, and much more, visit our FAQ’s section. A reservation is required in advance to bring cats to the Meow Mobile. To make an appointment, view the schedule, and send us an e-mail or call (305) 233-9958. (E-mail for faster response).